January 17, 1706 Born in Boston, the thirteenth child of a candle maker; only went through 2nd Grade, Apprenticed to his brother as a printer, ran away to Philadelphia age 17 . 1723 Arrived in Philadelphia penniless, readily found work as a printer. 1725-26 First trip to England. Researched printing equipment, but probably lived a riotous life. 1726-1748 Returned to Philadelphia to found his own print shop and bookstore. Wrote and printed Poor Richard's Almanack, organized local trademen into the Junto, formed partnerships with sixty printers throughout the colonies, obtained print business of local governments, became postmaster. Able to retire at the age of 42 by selling his business for 18 annual payments, which offered him comfort and ease for considerably longer than his life expectancy. 1751 Helped found Pennsylvania Hospital. Entered the legislature. 1751-1757 Active in legislature, rising to leadership during the French and Indian War, Pontiac's Rebellion and the uprising of the Paxtang Boys. 1757-1762 Second time in England. 1762-1764 Returned to Pennsylvania Legislature, where his unpopular agitation for replacing the Penn Proprietors with direct Royal goverment led to his electoral defeat and the end of his elective career. The defeated but determined Quaker party sent him to England to lobby against the Penn family and for rule of Pennsylvania by the King. 1764-1775 Third British visit. Although unsuccessful in his lobbying, his fame as a scientist made him welcome among the famous members of the Enlightenment, like Hume, Adam Smith, Mozart. Meanwhile, the colonies became considerably more rebellious than he was. His blunder with the publication of some letters gave the British Ministry an opportunity to humiliate and disgrace him in public, probably as a warning to the mutinous New England leaders. It irreconcilably alienated Franklin, who sulked, then packed up and joined the Continental Cangress the day he arrived back home. March, 1775-October, 1776 Brief but fateful return to America. Decisions were made in London to put down the colonists by as much force as necessary. Meanwhile, Franklin persuaded the Continental Congress they must declare independence from England if they expected help from the French. July 4, 1776 Independence is declared within days after the arrival of a massive British fleet in New York harbor. Franklin dispatched to France to secure the assistance he was confident he could get. 1777-1785 France. 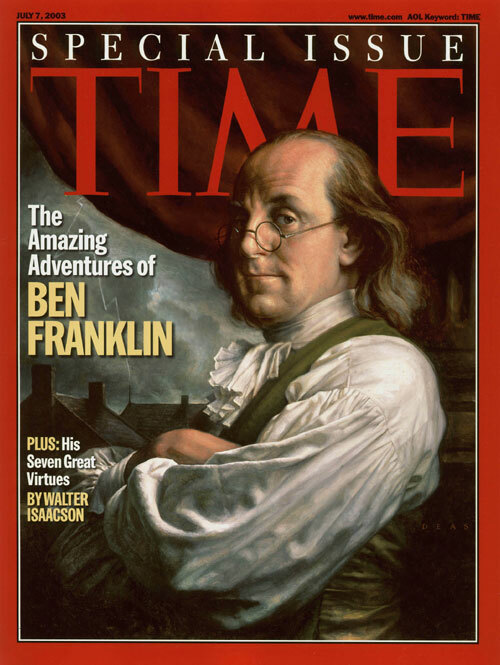 Franklin served admirably as American ambassador, his wit and charm persuading the French to overextend themselves with ships, supplies and money, and very likely contributing to the French Revolution by popularizing the American one. 1785-1790 Returning as a national hero for his final five years of life, Franklin loaned his personal influence to the Constitution convention, became President of Pennsylvania, worked for the abolition of slavery. April 17, 1790 Died, probably of complications associated with kidney stones.